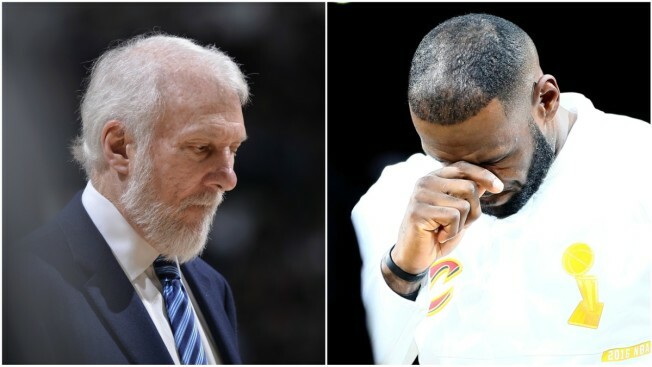 LeBron James says his emotions got away from him when discussing the death of Erin Popovich, wife of San Antonio Spurs coach Gregg Popovich. It was a raw moment caught on live television. Cleveland Cavaliers star LeBron James was asked his thoughts on the recently announced death of Erin Popovich, the wife of San Antonio Spurs Coach Gregg Popovich. In very un-LeBron James fashion, he halted, cursed and fought back tears in composing a response. James' stunned, emotional reaction had many on social media crying foul, believing TNT reporter Allie LaForce intentionally blindsided James with the question. Every producer on @NBAonTNT should be fired on the spot for approving the reporter to ask a tired, stressed LeBron James a question about Gregg Popovich’s wife who just passed away right after a game. After a hard fought win over #Indiana, asking #LeBronJames his feelings about the death of #Greggpopovich's wife a was pretty tacky post game question. Have they no decency? It Was Very Unprofessional For @NBAonTNT Reporter To Ask @KingJames About Gregg Popovich Wife... SMFH! Yeah He Had A Choice To Answer That Question Or Not BUT STILL... SMFH! But James says that couldn't be further from the truth. James said he was told he'd be asked about Erin Popovich before they went on camera, and that his emotions simply got away from him. "I'm not on social media right now, but I was made aware through some friends, through texts, that a question was asked to me postgame, and a lot of people feel like I was blindsided," James said on UNINTERRUPTED. "That is absolutely false. Allie LaForce told me that she was going to ask me the question and if it was OK."
"That was just my emotions coming straight from my heart about the late Erin Popovich," James continued in the video. "It's unfortunate, it's a tragic loss. My thoughts, my prayers once again go out to the Popovich family. To Gregg, to the Spurs family, to the whole Spurs fan base." James also took a second to implore those on social media to lay off the reporter. "Please get off Allie LaForce's back, because she followed the proper protocol and she warned me. Get off her back, man. She's very professional and she does a great job at her work." The Spurs confirmed Erin Popovich's death Wednesday. The team didn't provide further details. The Popovichs have two children and two grandchildren. They met at the Air Force Academy in 1970s when he was an assistant coach for the Falcons. Erin's father, Jim Conboy, was Air Force's head athletic trainer.